Via Cargo Ships and Jungle Treks, Africans Dream Of Reaching The U.S. : Parallels One of the lesser known tales of the world migrant crisis is taking place in Central America, where hundreds of Africans are landing with dreams of making it to the U.S. Via Cargo Ships and Jungle Treks, Africans Dream Of Reaching The U.S.
A woman builds a fire at a migrant camp on the Costa Rica-Panama border. 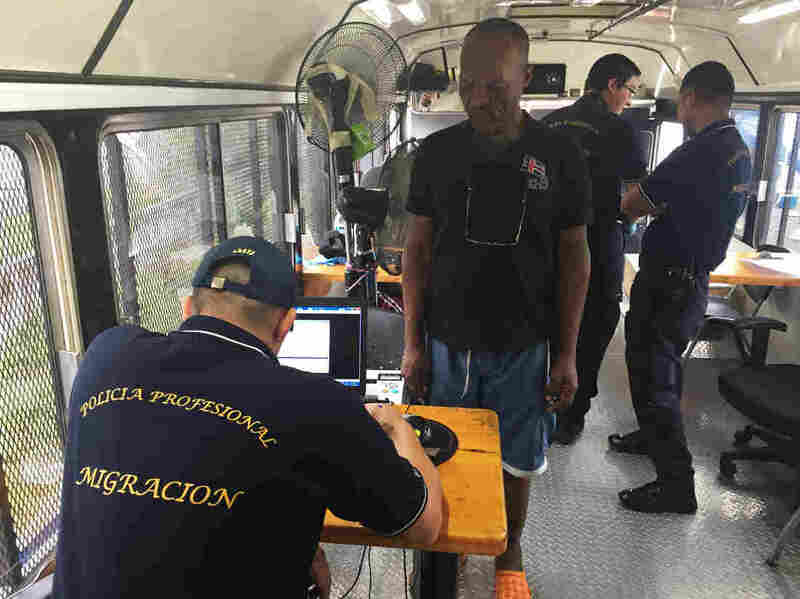 The area has seen a recent surge of migrants coming from Africa, hoping to make it to the U.S.
Costa Rican officials say more than 800 people claiming to be from Africa have come to their country in just the last two months. Most are believed to be from the two neighboring Congo states in central Africa. But in a visit this week, NPR also found Eritreans, Angolans and Nigerians. Authorities also suspect that some are from Haiti. Central America has long been the route north for people fleeing violence or poverty in Latin America. Now it's also a route from Africa. "We say Africa is here now in Costa Rica," says the Rev. Alberto Barrios Gutierrez, a priest who, along with his parishioners, volunteers to help feed the desperate new arrivals. By the time migrants reach the volunteers, they have usually walked at least a week through dangerous jungle. Some say the African migrants are appearing in greater numbers because it's become more difficult to reach Europe, a more traditional destination. Others say there has always been a small number of Africans traveling this route, but Nicaragua has tightened its borders, creating a roadblock. The Africans making the journey describe a harrowing trip. Some don't survive. Many pay smugglers in Africa to get them aboard cargo ships bound for South America. Some arrive in South American countries on the Atlantic Ocean and languish there in joblessness until they look for a better future north. Ezimwa Chimezie emigrated from Nigeria and has reached Costa Rica in the hopes of making it into the U.S. 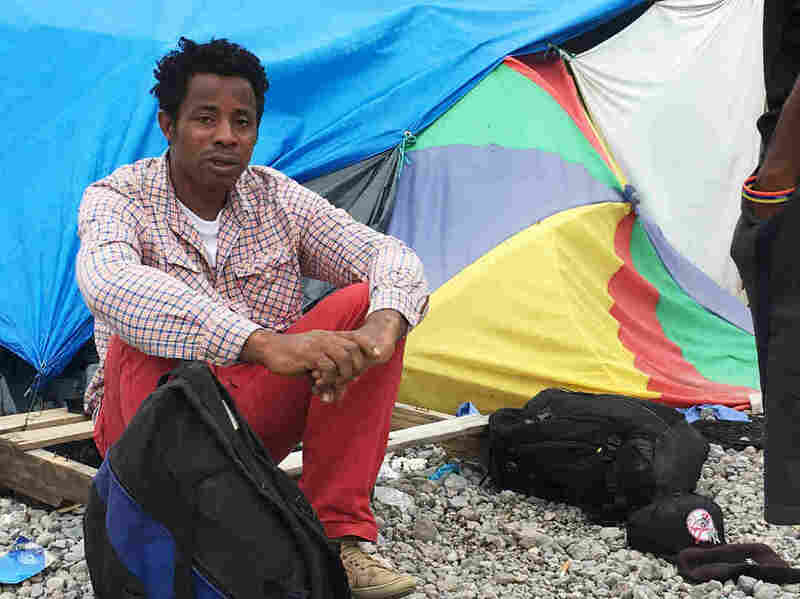 He is staying at a makeshift camp for migrants on the Costa Rica-Panama border. They may be fleeing violence, like Boko Haram militants in Nigeria, or civil strife in Congo or poverty in Angola. 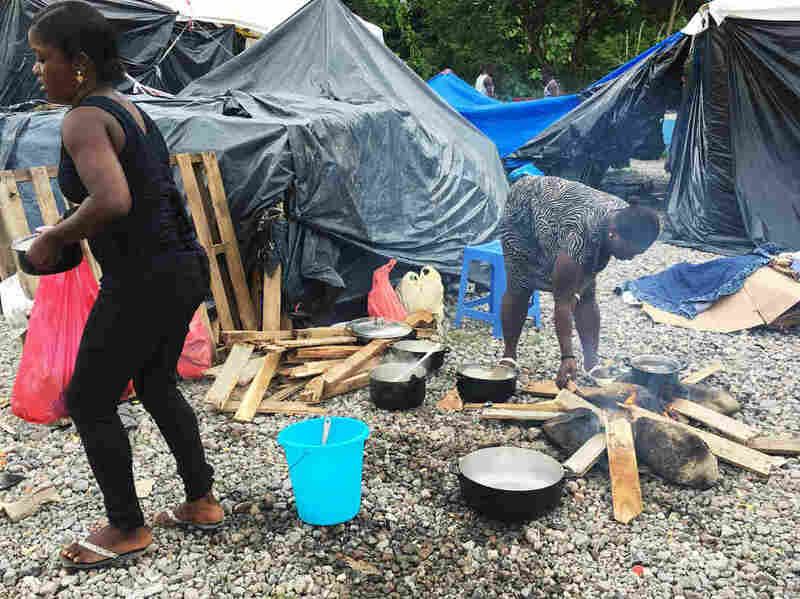 "I had a business that was completely burned down and destroyed," says Ezimwa Chimezie, a Nigerian at a tent camp set up by the Costa Rican Red Cross. He had a shoe factory that was set on fire by men who he says also stabbed him. Chimezie says it happened because he was advocating for human rights in Nigeria. NPR couldn't independently confirm his account or the accounts given by others. Chimezie said he flew to Ecuador and paid smugglers to secure his bus and boat travel to Colombia. Like most of the other migrants, Chimezie eventually came to the end of the road — literally. It's called the Darien Gap, an expanse of jungle with no roads between Colombia and Panama. It's nearly 100 miles long. "It's hell. It's hell," Chimezie says. "I ain't got no words to describe the experience." Barely aware of the geography of Central America, Chimezie had been told to expect a three-hour jungle walk. It took days. "It's like walking five solid days on an empty stomach," he says. Others say it took them nine days to get through the jungle. They describe eating grass to survive, being devoured by bugs and seeing bodies left behind under the thick brush. Migrants are processed at an impromptu post on the Costa Rica-Panama border. Chimezie made the trip a couple weeks ago. His feet and legs are still swollen, pus seeping from a toe. Alfredo Delvas, from Congo, says he also made the jungle journey. He shows us his temporary home in the Costa Rican Red Cross camp, pulling back the black plastic tarp on his tent. He's with about 15 people, sharing a couple of blankets and a few wooden pallets on the ground. Resources from the Costa Rican and Panamanian governments are scarce. Costa Rican officials say they can't keep housing the Africans. Nicaragua refuses passage northward. And Panama, to the south, won't give them permission to stay. "If this migration continues, it will be a very dangerous situation not only for Costa Rica but also for the region," says Costa Rican Communications Minister Mauricio Herrera. His country asks for international aid, but he says it has not received any for the three shelters it runs. It plans to add a fourth next month. Meanwhile, the church led by Barrios tries to lend a hand. Volunteers dole out mounds of rice, chicken, beans and plantains for the migrants at this camp twice a day.